Are you in the mood for some good news? Jamie Lynn Spears’ daughter, Maddie has finally been released from the hospital, after being in a critical but stable condition, following her recent ATV accident. The 8-year-old was released from the hospital and used a helicopter to get home after being discharged. She is still receiving oxygen and is being monitored closely. A representative for the family also stated that there appears to be no neurological damage from the accident. Maddie’s stepfather Jamie Watson, revealed the news on his Instagram account. Britney too, took to Instagram to thank her fans for their prayers and well wishes, after asking them to think of her family. It was a close call for Spears’ niece, and it’s nice to breathe a sigh of relief that little Maddie is recovering nicely. 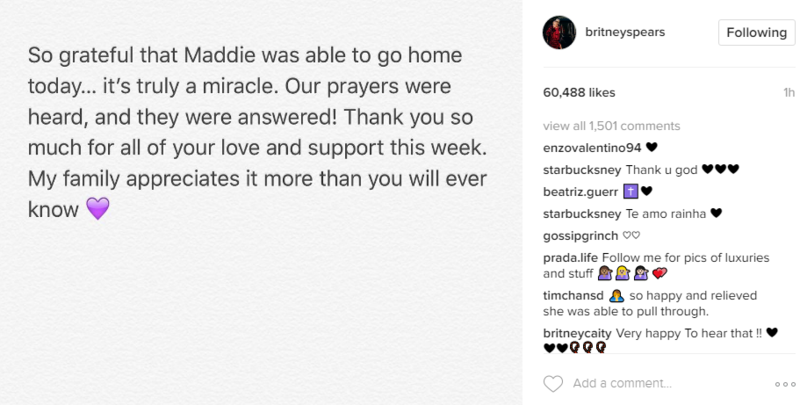 We are just happy to hear that Maddie is doing great, and thankful Britney has kept us updated! Britney Spears’ Hot Pics: Here are the Best Pics of the Pop Princess!